Read about the experiences of our satisfied travlers! This was our first Dialysis at Sea cruise. We both were very pleased with our experience especially my husband, Pasquale, who was the dialysis patient. The DASC staff members on board the ship were pleasant, helpful, and accommodating, especially Johnny the RN and Marc the LPN, and Dr. Karp. The dialysis facility was comfortable and the use of large beds was very relaxing. All of this put together made our first experience with DASC special, so much so that we would not hesitate to go on another Dialysis at Sea cruise. We were happy with the Holland America ship and crew. This was not our first cruise with Holland America and the size of the ship makes for a pleasant and easy trip; You are not tripping over thousands of people. We loved the itinerary to Bermuda... It would be nice however if you had some Holland America trips to the Mediterranean since I know that they have very varied itineraries to that part of the world. Lastly, I would like to commend the staff that I worked with in you offices in Florida, namely Brandie in sales and Joy in medical records . Everyone was organized, helpful, and pleasant. This helped make the trip easy and relaxing without anxiety. Thank you again for all you help! "hoping to take another dialysis cruise"
My husband Jacob went to heaven over six months ago. It is quite difficult to see your brochure come to our address. We enjoyed our Alaskan cruise very much. The dialysis people were absolutely wonderful to him and me. 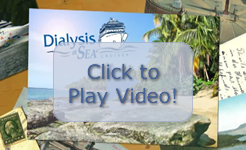 We were looking forward, hoping to take another dialysis cruise, but it was not to be. I am grateful that your company exists. I only wish we had been made aware of it several years earlier! My husband and I told everybody in our dialysis center that we ever visited how wonderful we think you all are! I am so grateful we had that precious time together on the one cruise we took. Just three months after we got home, he had a bad accident and spent most of the next year in the hospital. I am truly grateful for the cruise memories. He really enjoyed remembering that trip. "thank you again from the bottom of my heart"
Words cannot express how extremely grateful I am, and how much it meant to our entire family, that you made the decision not to cancel my brother Chuck's dialysis. We have just returned from our 7-day Caribbean cruise on Holland America and were ecstatic about the excellent service from your company. Not only did Chuck receive the dialysis treatments he needed, but he also got valuable advice that could lead to better and more effective treatments in the future. In fact, his nurse, Barbara, and his doctor, Ron, were so helpful and caring that our entire family felt we had become friends by the end of the cruise! I know that you suffered a large monetary loss by allowing Chuck's dialysis to proceed even though he was your only patient on that cruise. But I assure you, if you could have witnessed the happy scenes of our family celebrating my parents 60th anniversary for seven solid days, you would be totally convinved that you did the right thing. Thank you again from the bottom of my heart and God bless you! We have just returned from our cruise and I must say, both Campbell and I couldn't be happier with the dialysis treatment he received on the ship. The entire dialysis team from the time of arrival to departure was first class. Many thanks to all and we will be travelling again soon!
" it was Wonderful, wonderful, WONDERFUL"
Dear Brandie, just back from our Alaskan cruise; it was Wonderful, wonderful, WONDERFUL!!!!! Thank you so much for all you work setting things up and working with me. Thank you also for the great robes that were waiting in our room, beautiful Rotterdam cooking book and galley tour (great!). Wow, what a surprise and just such a nice gesture on your company's part. Our room was nice and big, great location and my girlfriend had also ordered champagne and balloons for our room, so we were really set!!!!! The dialysis clinic worked out very well; very nice nurses and the doctor came around to see Barry. The facility was ok and got the job done. We met several other patients and everyone was happy to be able to cruise. Care vacation also had the scooter and oxygen waiting in the room so that was great too. As it turned out Barry couldn't see well enough to drive the scooter and that became a nightmare for me, so I ended up renting a wheelchair from the ship the second day and that was a lot better for us both. (it's only money!) All of our friends made it, there were 15 of us and we really enjoyed it all!!!! Thank you again, it was easy as you said and I could pack my bag again today and go!!!!!!! Not sure Barry would go with me so soon, but that's ok too. Ha. Anyway, you are in my mind with a pleasant smile and in my address book, so who knows maybe that Mediterranean cruise will come to reality... anyway, it's been a pleasure writing and talking to you, Brandie. You really do an excellent job and I would gladly work with you again.